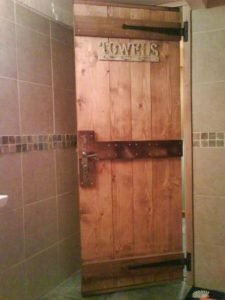 In a world where railway sleepers, wheelbarrows, drinking troughs and milk churns are considered the height of shabby, eco-friendly chic, it comes as no surprise that scaffold boards have joined this re-purposing and recycling trend. You have only to search on Pinterest to find a host of cost-effective and attractive projects, from shelving and bookcases, to tables and worktops. 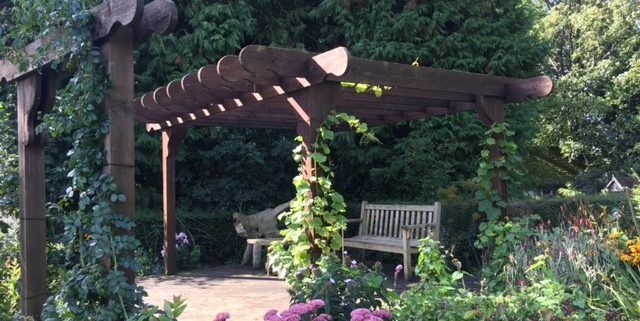 Some of Gilray Plant’s boards have ended up being used very creatively: this beautiful pergola was built out of our rejects, giving a sheltered outdoor living space and creating visual interest, as well as a habitat for creeping plants, such as vines. 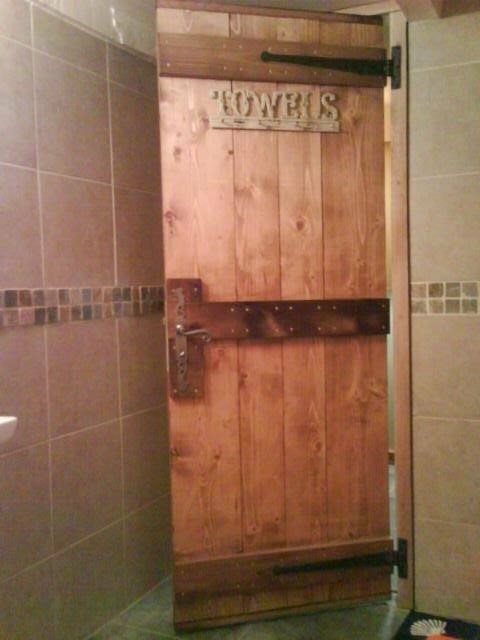 And the bathroom & garden doors pictured above were also made with Gilray boards. When used outdoors, scaffold boards can be left untreated, or stained and coated, to add weatherproofing. 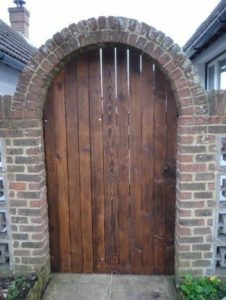 Typically made out of untreated spruce, the natural colour of reject or used scaffold boards tends toward a light brown which weathers to grey over time. The typical life of an untreated board, left outside in all weathers might be as much as ten years if not treated with a proper wood preservative. 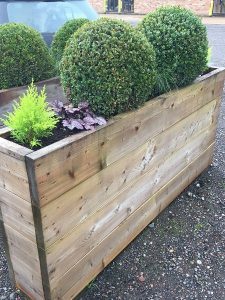 But left untreated, they also make great organic planters or raised beds for vegetables or herbs. 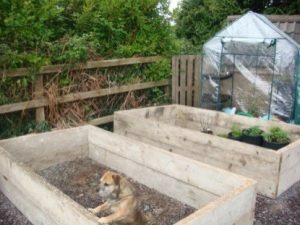 I don’t think this user intended them to be employed as a kennel but can anyone say sandpit for the kids? Why not? And how about a tree house or a nice outdoor sofa? The rugged nature of the boards makes for a durable piece of furniture, and far more stylish than metal, plastic or rattan. 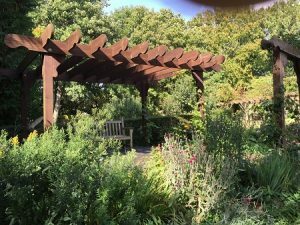 Judging by the amount of forums, Q&A pages and pinterest shots of home-grown projects, the use of scaffold boards is more of a grassroots movement, rather than a standard option from the green construction industry. So where do you source the wood you need for these projects, and how do you get started with your own project? For ideas Pinterest is definitely a great place, along with the ubiquitous YouTube tutorials. Your local hardware store will be able to advise on stains and finishes, and you can purchase the boards from us, of course! Have you ever thought of making scaffolding your career? It is interesting and varied work and the financial rewards for qualified scaffolders and advanced scaffolders can be substantial. In theory, anybody can call themselves a scaffolder, as there are no statutory regulations or licensing requirements. In practice, however, the scaffolding industry strictly regulates itself and unqualified operatives are unlikely to find long term employment, as anything other than a labourer. The training costs associated with becoming a qualified scaffolder are substantial, with additional costs required to progress to advanced scaffolder level. But for promising staff, most scaffolding companies will pay most, if not all, of the costs associated with training their employees. The Construction Industry Scaffolders Record Scheme (CISRS) has been the industry’s training and certification scheme for almost 50 years. It is recognised by all of the UK’s major construction organisations, including the HSE, Build UK, CSCS, NASC and the Construction Unions. Established in the 1960s, CISRS currently has over 60,000 cardholders in the UK, with a further 5,000 cardholders in the Overseas Scaffolder Training Scheme (OSTS). To start with, to become a scaffolding labourer or a trainee scaffolder, you need to undertake a 1-day New Entrant Trainee and Scaffolding Labourer Course, which is known as the COTS Course. 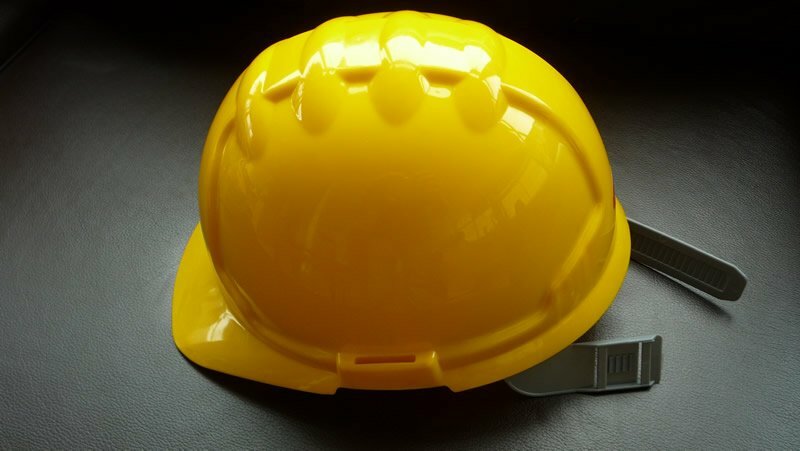 This course is designed to provide new starters with the basic skills to allow them to be able to work safely on site. In order to apply for a CISRS card, you would also be required to pass the CITB Health, Safety and Environment Test. CISRS cards at this level are issued either as Labourer or Trainee Scaffolder. 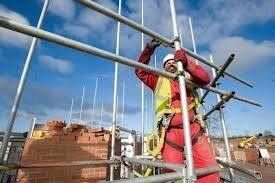 Trainee scaffolders are required to be supervised by a qualified scaffolder, at all times during their training. Their training period commences with a minimum of 6 months’ on-site work experience, after which they are eligible to attend a two-week Part 1 training course. Following the successful completion of this course, you would then undertake a further six months’ work experience, before being able to attend a two-week Part 2 training course. To complete your training, you would then complete the Level 2 NVQ in Access and Rigging and pass a one-day Final Skills Assessment. After this, you can then apply for a CISRS Scaffolding Card! And after a further 12 months’ on-site experience, you could commence your Advanced Training. This involves attending a two-week Advanced Training course, completing a Level 3 NVQ in Access and Rigging and passing a two-day Final Skills Assessment. Scaffolders can further progress to Scaffolding Supervisory and Management training. All training is undertaken off-site at CISRS Accredited Training Centres. Originally, CISRS training was aimed at scaffolders who erected and dismantled “Tube and Fitting” scaffolding. But the scheme now extends this training to cover “System Scaffold” products which have been approved for training purposes. Another route to training to Scaffolder Level is to take an Apprenticeship. This normally extends over a 18 month period and involves 10 weeks’ off-site training at a CISRS Accredited Centre. 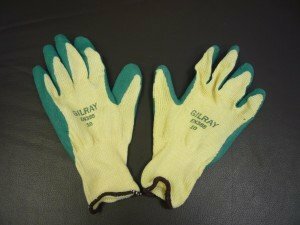 The CITB college at Erith (National Construction College South) is very close to us here at Gilray Plant and we regularly have students pass through our doors to buy spanners, frogs and hats! To find a college near you or for more information, visit the CISRS website http://cisrs.org.uk. Good Luck with your “New Year, New Job” search! 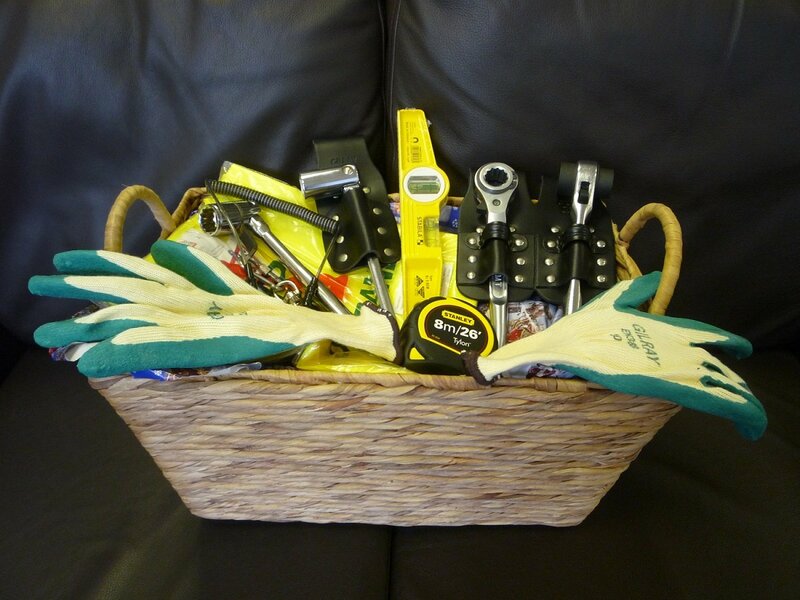 Christmas Pressies for Scaffolders – Sorted! 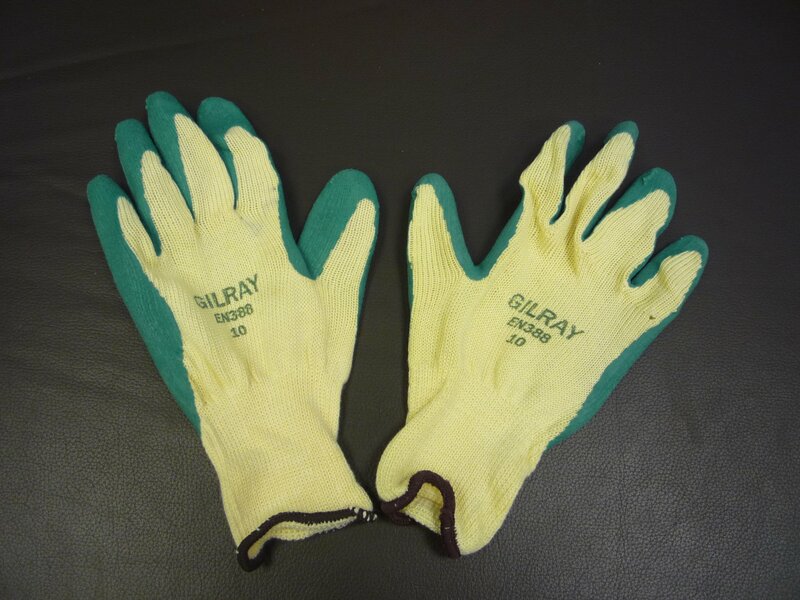 So if you are looking for practical, handy-man Christmas presents for the scaffolder in your family, look no further than Gilray Plant. We have a large range of scaffolding goodies, enough to satisfy even the most demanding of scaffolders. 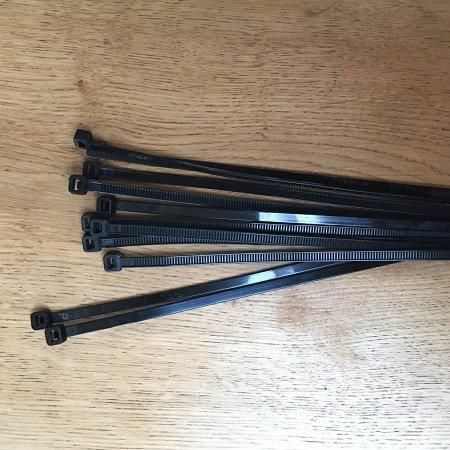 From a wide range of spanners, ratchets and spirit levels to heavy-duty leather tool holders, we should have something to suit all tastes and budgets. For instance, how about debris net ties? One year at a girls’ pre-Christmas get-together, as a joke I gave each of my girlfriends a pack of debris net ties for the men in their lives. Whilst I remember thinking, “That’s a bit sad”, I found other friends saying they had used them in the garden, in the house, on a boat, and even a stable. They are so incredibly versatile and useful. They come in packs of 100 and would make the perfect practical stocking filler. To fill the sack up and to create a complete scaffolder’s Christmas “hamper”, browse our website to see our gloves, spanner range, spirit levels, tape measures and leather holders for these items. The sack will be perfect for carrying all his tools until he gets to site and then useful on site! 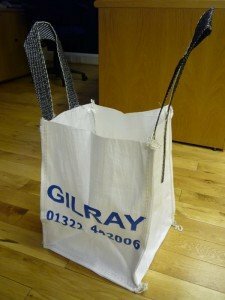 To make your Christmas present shopping easy, you can shop online at www.gilray.co.uk for delivery within 24 to 48 hours by courier. Or call our office on 01322 442006 between the hours of 8am to 5pm, Monday to Friday if you want to discuss any products. Christmas Pressies for the Scaffolder in your life!